Phang Nga Bay is a 400 km² bay in the Andaman Sea between the island of Phuket and the mainland of the Malay peninsula of southern Thailand. Since 1981, an extensive section of the bay has been protected as the Ao Phang Nga National Park. The Park is situated in Phang Nga Province, at 08°17’N 098°36’E. 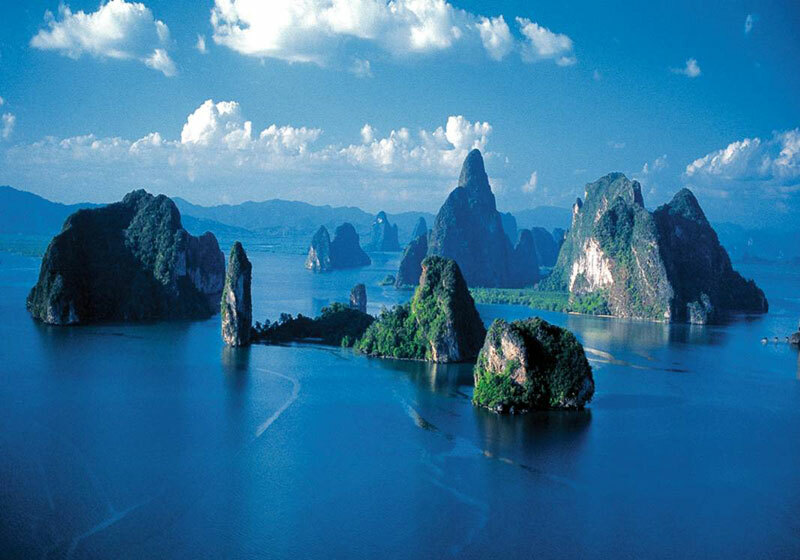 Limestone cliffs with caves, collapsed cave systems and archaeological sites are found about Phang Nga Bay. Some 10,000 years ago, when sea levels were lower, one could walk from Phuket and Krabi. Phang Nga Bay Marine National Park was declared a protected Ramsar Site (no. 1185) of international ecological significance on 14 August, 2002. Phang Nga is a shallow bay with 42 islands, comprising shallow marine waters and intertidal forested wetlands, with at least 28 species of mangrove; seagrass beds and coral reefs are also present. Short Description: Ao Phang Nga National Park is in Phang Nga Province in southern Thailand. It was created by royal decree and announced in the Royal Gazette under proclamation number 98, section 64 of 29 April 1981.